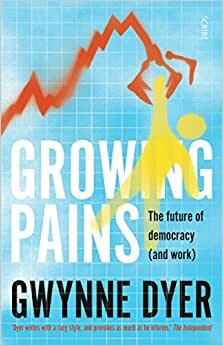 Dyer examines the global challenges facing us all today and explains how they have contributed to a world of inequality, poverty, and joblessness, conditions which he argues inevitably lead to the rise of populism. The greatest threat to social and political stability, he argues, lies in the rise of automation, which will continue to eliminate jobs, whether politicians admit that it is happening or not. To avoid a social and political catastrophe, we will have to find ways of putting real money into the pockets of those who have no work. Start reading Growing Pains: the future of democracy (and work) on your Kindle in under a minute. Dyer writes good books. If you liked Climate Wars, this book will top it. The increasing income gap and automation will be the challenges to face. Enjoy! Enjoyable and thought-provoking. Highly recommended to know that the world won't end just yet despite some of our "leaders".